I'm not really sure what you intend for me to gather from that thread. I read that earlier. You mentioned someone possibly mis-labeling a board so I posted a pic to show that it's more than just a mis-labeled board. The layout and components match that of a 250. I noticed the 250 board mentioned in that thread did not replace a 200 board in his device without modifying his device. That is what I'm thinking yes. I sent them a 200 and got a box with a 200 label on it, but the picture I posted is what was inside. Everything in Escribe points to a 200, while looking at it points to a 250. I'm not quite sure what that person in that thread really had to do. I swapped out a Hobo X DNA200 with a 250 board and had to modify nothing. It could just be whatever mod he had, the makers had some type of screen mount that attached to the board itself which yes, there would be extra bits in that area. I'm not unhappy by any means. Just curious if this is a way for them to phase out the 200. Replace all old 200's with a 250 and leave it up to the end user with a firmware update. that's a 250 board. at least the hardware layout is that of a DNA 250. post a pic of the front. that will tell me a lot more than just a pic of the back. that will also tell me what charging circuit it has. it can be possible you have the incorrect firmware on the board, your setting in EScribe are incorrect (kanthal limit, USB charge current limit) who knows. i don't see why evolv would send you a 250 limited to 200w, the 200 was not discontinued. although it is a direct drop in replacement for the 200, the 2a charging components make it necessary to modify the screen holder of many mass produced mods in order for a correct fit. That's the only one I have of the front. It's in the mod now. ya that's 100% a DNA 250 board. you see the component (inductor) on the front marked "4R7"? 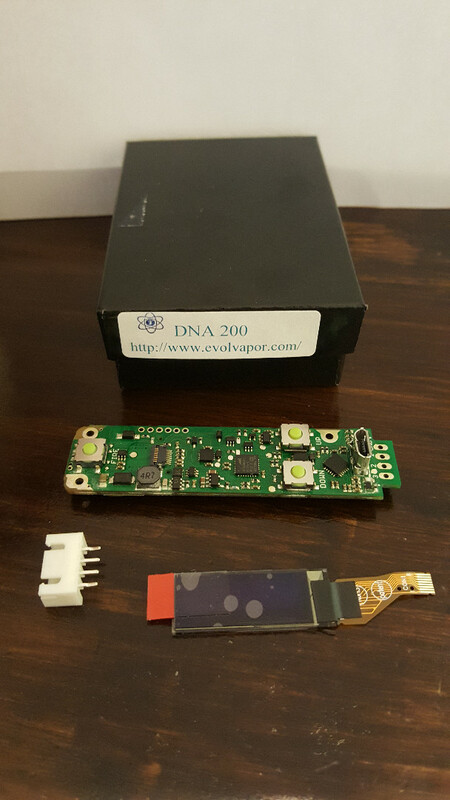 that is one of a few new components, only on the DNA 250, responsible for the 2a charging. if you go into EScribe, the USB current, on a DNA 250, should be limited to 1a and .5a for a DNA 200. do you see 1a? post a screenshot of device monitor with the USB voltage and current boxes ticked. also post a SS of your battery settings. this is interesting me. Also this is what I get when I retrieve the device information. Here's the USB boxes ticked. i would email evolv and ask them what's up with......."that". then post back here with the response you receive. as long as it's working for you and you're happy, that's what matters. just very curious as to why they sent you a "200 - ized" 250 board. maybe that's what they're sending out now for a 200 replacement, but that doesn't make a whole lot of sense me. i just don't know! It doesn't make sense to me neither. When I sent my 200 in, I emailed them and asked them if it could be replaced with a 250. The gentleman told me that it was not possible. I opened the box today and was actually shocked they sent what I thought was a 250, until I hooked into Escribe. ya your charging at .8xx amps from EScribe (would be 1a if you had a better USB cable. the USB current is limited if the USB voltage falls below 4.26v). so i bet it WILL charge at 2a if you get a good USB cable capable of passing 2a and a good 2a wall charger. what happens if you try and change your "kanthal power limit" to 250 and "upload" that to your mod? does the mod NOW go up to 250w? edit... and you would have to change your input amps to 28 for both fields. edit2... LOL your running 2 cell so 167 would be the max on kanthal power limit when in 2S mode.